A late penalty in the match gave Western United to clinch the game but Benjamin Totori sent this attempt wide much to the dismay of clubs and his own bench. The result moves Western United to 18 points but this is two points where they would like to be after the match. Ironically it was former Western United midfielder, Coleman Makau, who starred for Malaita Kingz with a double in the first half. His first goal came five minutes after the opening whistle but it was cancelled within 12 minutes by Totori from a free kick. Western United then took the lead through Atkin Kaua who headed home a pin point cross by Himson Teleda. 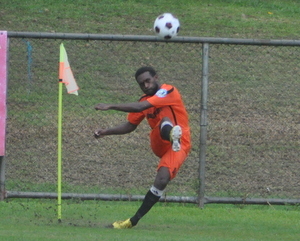 This gave Kaua’s side 2-1 lead which lasted only until just before the break when Makau got his second to equalise. The second was tightly contested and it was not until the past the hour mark that the scoreline changed. Teleda who earlier set up a goal for Kaua scored to regain the lead for Western United. Malaita Kingz replied with aggression in the upper third of the field and were rewarded with a penalty. Fred Bala easily slotted home the spot kick to once again equalise and keep his club within point range. It was another good result for new Malaita Kingz coach, William Omokirio, who has not lost a match since taking over the club in second round of the season. They are now in sixth place with 13 points where they sit ahead of Hana and Real Kakamora respectively.